It has been suggested by some that, rather than developing or implementing Uniclass2, we in the UK should switch to OmniClass, used in North America. John Gelder, Head of content development and sustainability, takes a critical look at the OmniClass Work Results Table, comparing it throughout with the Uniclass2 Work Results Table. OmniClass is the North American equivalent of Uniclass2 and is promulgated by CSI (Construction Specifications Institute) and CSC (Construction Specifications Canada). Broadly speaking OmniClass is in a similar position to Uniclass 1997, with much the same general limitations, though it is rather more unified. Uniclass articles corresponding to this one include Reclassification and The new Uniclass Work sections table. For a review of OmniClass in general, refer to the separate article OmniClass: a critique. Like Uniclass Table J (aka CAWS), the OmniClass Work Results Table (aka MasterFormat) is geared mostly to the specification of systems and products, and so is focused on the construction phase. It doesn’t serve the whole project timeline, as it doesn’t have homes for high-level (early-stage) objects such as Complexes, Activities and Elements. This means that the Table can’t properly serve design-build and design-build-operate procurement (which, in the latter case, typically requires the contractor to be involved from the very beginning of the project, as part of a consortium). Other Tables within OmniClass must be used to structure specifications for Entities, Spaces and Elements. Tables outside OmniClass must be used for other object classes. These would then need to map to each other and to the Work Results Table, in order to properly integrate the specification component of the building information model (BIM) along the project timeline. Given the lack of congruence, this won’t be easy. Even mapping between systems and products is problematic because, read with the non-OmniClass SectionFormat, there are no homes for System outline (or compositional) specifications. Indeed, Systems and Products are conflated. This means that the Work Results Table, plus SectionFormat, can’t properly serve BIM, which requires mapping between objects of different classes in the object hierarchy (e.g. this product is part of that system, this system comprises those products). Making this explicit in the specification requires outline specifications. We can’t rely on this mapping being delivered through the geometrical part of BIM (CAD) since many systems and products are not modelled geometrically at all. The Uniclass2 Work Results Structure Table provides for outline (compositional) specifications all down the object hierarchy, including Systems-to-Products, so fully supports BIM. Table 5 illustrates this (left-hand column). SectionFormat has a home for the specification of performance and design criteria of products, which in turn are defined as including systems, assemblies, manufactured units, equipment, components, product types and materials. That is, SectionFormat doesn’t really distinguish between products, systems and materials, though OmniClass at large does (in the Products, Work Results and Materials Tables). ‘Performance’ at a higher level was in sub-group 01 80 00 Performance requirements in the 2004 edition of this Table, but this has been dropped in the 2011 edition. As it was actually mostly about elements rather than systems (e.g. 01 83 16 Exterior enclosure performance requirements), the idea is probably that this is specified using a specification aligned to the Elements Table. The Uniclass2 Work Results Structure Table provides for performance specification of objects all down the object hierarchy, so fully supports contractor (and other) design. It also makes a clear distinction between Elements, Systems and Products (and so on) – this is essential for a rational approach to hierarchical object modelling. Table 5 illustrates this (left-hand column). In the OmniClass Work Results Table, the commissioning and maintenance of systems (elements, actually) are not described in the system sections, but in separate sections in sub-groups 08 and 01 of each group, respectively, e.g. sub-group 09-08-00 Commissioning of finishes and section 09-01-70 Maintenance of wall finishes (see Table 6). This is rather inconvenient for those wanting to have everything about a given system collected together (though of course this could be managed through reporting in a digital specification tool such as NBS Create). All aspects of each system, from design to operation, are collected in each of the System sections in the Uniclass2 Work Results Structure Table. Table 5 illustrates this (right-hand column). The general sequence of sections within each Group doesn’t fully reflect construction sequence. For example, operation and maintenance should be last, and commissioning should be second-last, but this isn’t the structure at all. All of this is held in sections that precede those describing the thing yet to be designed and built. See Table 6. The System section structure in the Uniclass2 Work Results Structure Table fully reflects construction sequence. See Table 5 (right-hand column). The OmniClass Work Results Table has deficiencies, specifically with respect to serving the entire project timeline and all procurement routes, and supporting BIM. It has a construction phase focus, and so has no homes for the specification of high-level objects such as Complexes, so it can’t deal with early project stages. System operation and maintenance specifications are isolated from descriptions of the systems themselves, so it doesn’t serve the occupancy phase as well as it might. Together this means that the Table is not well-suited to non-traditional modes of procurement, such as design-build and design-build-operate. The Work Results Table conflates systems and products, and has no homes for outline or compositional specifications. Together these mean that the Table doesn’t support hierarchical object mapping, a key requirement for a BIM specification. This is exacerbated by the Table – and OmniClass as a whole – not supporting classification of high-level object classes and systems. Without these object classes we cannot produce a complete ‘building’ information model. Finally, the basic design-build-operate sequence is not implemented fully in the Work Results Table, nor in SectionFormat (e.g. a proposed FM subsection has not eventuated; system-wide performance requirements are not distinguished from those for ‘mere’ products). This makes the default structure rather messy. BIM requires a unified approach to classification if it is to work well, e.g. with simple mapping between classification Tables. OmniClass cannot deliver this, as it stands. Uniclass2 can. via http://www.4Clicks.com – Leading cost estimating and efficient project delivery software software solutions for JOC, SABER, IDIQ, MATOC, SATOC, MACC, POCA, BOA, BOS … featuring and exclusively enhanced 400,000 line item RSMeans Cost Database, visual estimating / automatic quantity take off ( QTO), contract, project, and document mangement, all in one application. The “I” in BIM, OMNICLASS, and the Criticality of Getting it RIGHT…. Now! In order to efficiently manage the life-cycle of the build environment, robust process, terms, and decision support tools are required that deal with physical and functional conditions, costs, priorities, risks, etc. The ability to define a “thing”, and recall that “thing”, and be able to discuss that “thing”, and all of its attributes, and track it’s changes…both planned, and unplanned, is critical. Yet, the capability is NOT present at this time. Here’s a short list of what is holding us back. The good news is that it’s not “rocket science”. The bad news is that is will REQUIRE SIGNIFICANT CULTURAL CHANGE with the Architectural, Engineering, Construction, Operations, and Owners sector. Collaborative, cloud-based systems that are multi-language, multi-currency, secure, fast, and never delete information. A life-cycle vs. first cost mentality/approach for planning, decision-making, and resource allocation. OMNICLASS and cloud-computing will enable BIM leap to the next level, that is…. life-cycle management of the built environment, vs. pretty pictures. (IFACT) – The National Building Information Model Standard (NBIMS) is a set of interoperable standards for exchange of facility and infrastructure data through the life-cycle of a project. NBIMS is a joint project coordinated by National Institute of Building Sciences (NIBS) in conjunction with the buildingSMART Alliance (bSA) and many other facilities-related associations and software companies. Progress towards compiling new abbreviations to submit to the United States National CAD Standard® consensus process. Construction Specification Institute is the key authoring authority on project. Future Applications – Enhancements to OmniClass and the United States National CAD Standard® will allow a higher degree of data integration for all related software solutions and facility management systems. via http://www.4Clicks.com – via 4Clicks.com – Premier cost estimating and efficient project delivery software featuring visual estimating, best representation of RSMeans Cost Data, contact, project and document management, for facility renovation, repair, sustainability, and minor new construction : JOC, SABER, IDIQ, IPD, SATOC, MATOC, BOCA, BOA, …. The Emperor is still naked! Is the trend analysis of the Business Value of BIM in North America from 2007 through 2012 reality, or are many of us walking around with rose colored glasses? I ask you, do you really believe the following statement ” Now in 2012, 71% of architects, engineers, contractors, and owners report they have become engaged with BIM on their projects …”. 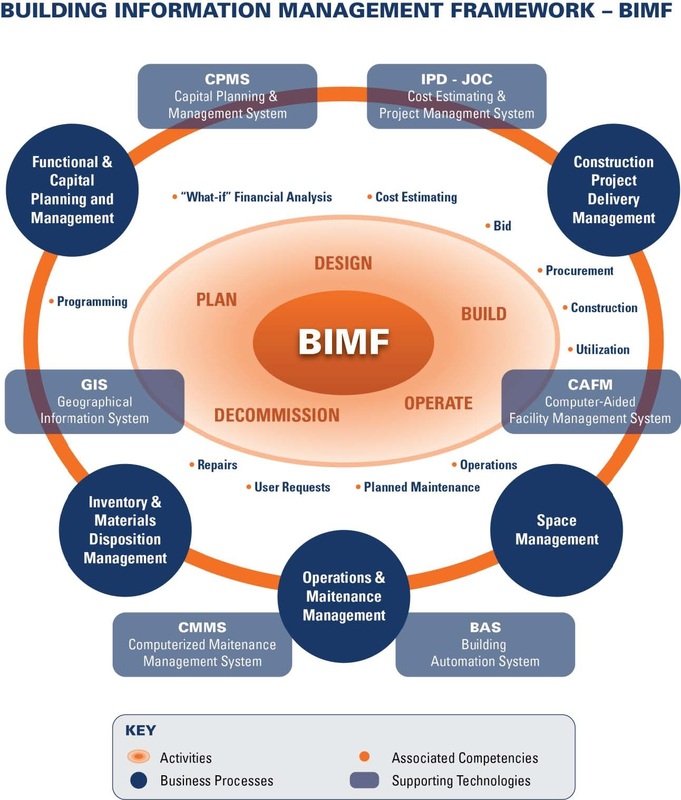 If you define BIM as the life-cycle management of the built environment supported by digital technology, I can tell you that either the survey is flawed… a lot of people don’t know what BIM is… or we have a lot of folks inflating the truth. There is NO WAY 71% of ANY of the groups are “engaged with BIM on their projects”…period, end of story. Playing with Statistics? The 71% average appears to have been calculated by taking a simple average of the “adoption rate” from architects, engineers, and contractors” from three size classes of firms “small, medium, and large”. If I am correct, this is just plan WRONG. Most firms in the U.S. are small business, thus a weighted average must be applied. The “adoption rate” for small firms 50%… a number I also believe to be inaccurate. I just came back from the NIBS Conference. This is without question, the most valuable, authoritative meeting relative to BIM in the United States. How many people were there you might ask? A few hundred at most. So, what does any of this matter? Simple really. Until our industry stops the hype and focus on important issues relative to BIM, we will continue to be mired in inaction. The AECOO is the most unproductive business sector and also has the lowest rate of technology adoption. These are facts…. if one wishes to be interested in facts that is. Greater adoption and use of collaborative construction delivery methods: IPD – Integrated Project Delivery, and JOC – Job Order Contracting. The later is a form of IPD specifically targeting renovation, repair, sustainability, and minor new construction projects. Let’s face it, 80% or more of all funding for the built environment will be going in renovation, repair, and sustainability. Emphasis on business process, strategy, and standardized terms, metrics, and data architecture vs. technology. Technology is NOT the problem, is the lack of clear, robust business strategy and processes, and domain knowledge… largely on the part of Owners that is the primary obstacle to progressive change. Owners write the checks, they are “where the buck stops”. Focus upon life-cycle costs / total cost of ownership, vs. first costs. A bit more on data standards…. OMNICLASS, UNIFORMAT, MASTERFORMAT, COie, IFC, et al… all have there roll. Some will survive, some may not. The point is that unless we have standardized terms, definitions, detailed reference and actual cost information (localized materials, equipment, and labors), physical and functional condition metrics, etc. etc. etc. … we can’t collaborate or improve productivity! Participation by all stakeholders – Owners, AE’s, Contractors, SubContractors, Building Users, Oversight Groups, Regulatory Bodies, Building Product Manufacturers, Communities, …. 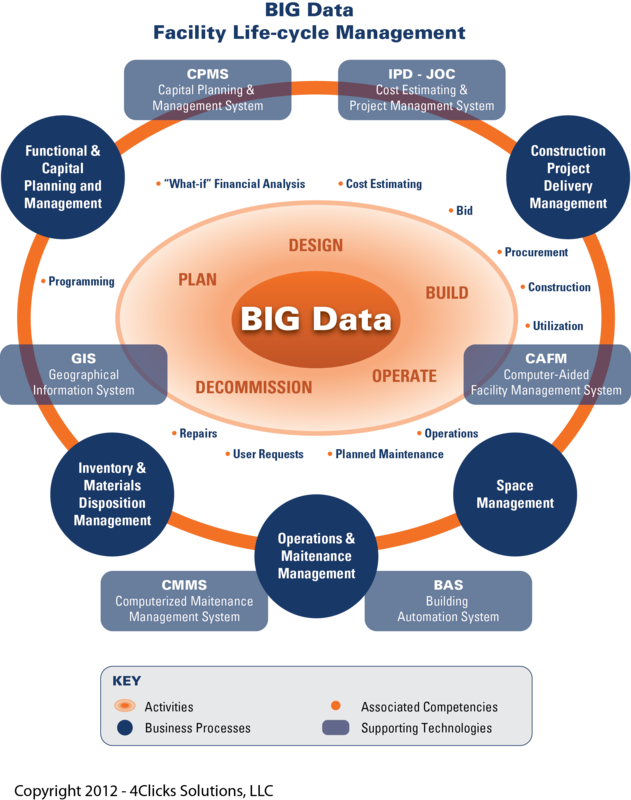 BIM (Building Information Modeling) is the life-cycle management of the built environment supported by digital technologies. As such it is a process of collaboration, continuous improvement, transparency, and integration. 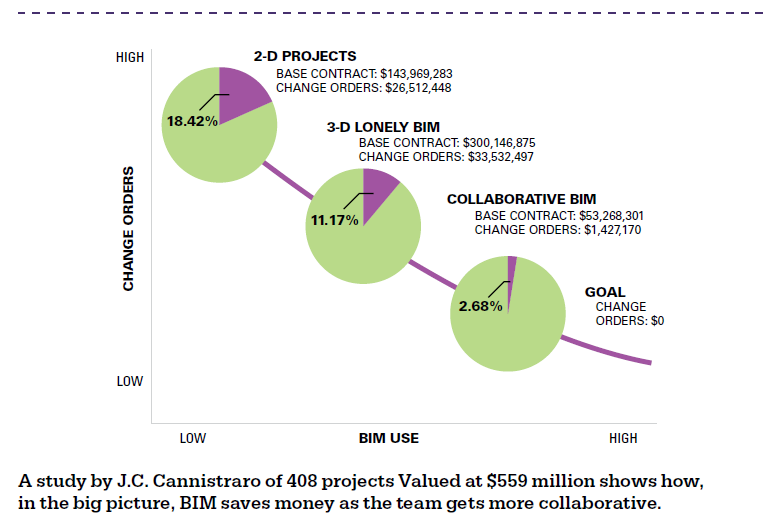 3D distractions aside, achieving optimal return-on-investment (ROI) on BIM requires focus upon change management, first and foremost. Ad-hoc business practices, traditional construction delivery methods, and legacy software must be cast aside. Life-cycle management: Process-centric , longer term planning and technologies that consider total cost of ownership, support decision making with current, accurate information, and link disparate knowledge domains and technologies. Standards and Guidelines: Common glossary of terms, metrics, and benchmarks that enable efficient, accurate communication on an “apples to applies” basis. Collaborative, Open Technologies and Tools: Cloud-based systems architectures that enable rapid, scalable development, unlimited scalability on demand, security, real-time collaboration, and an full audit trail. (Johnson et al. 2002) – There is an interrelationship between business goals, work processes, and the adoption of information technology. That is, changes in business goals generally require revising work processes which can be enhanced further by the introduction of information technology. But we also recognized that innovations in information technology creates possibilities for new work processes that can, in turn, alter business goals In order to understand how information technology influences architectural practice it is important to understand all three of these interrelated elements. National Institute of Building Sciences buildingSMART alliance™ has released The National BIM Standard-United States™ (NBIMS-US™) Version 2 (V2). The document is intended to cover the full life cycle of buildings—from planning, design and construction to operations and sustainment. 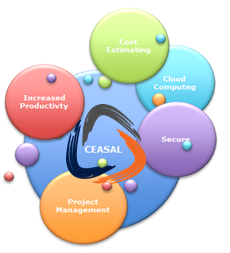 via http://www.4Clicks.com – Premier cost estimating and efficient project delivery software – JOC, IPD, SABER, IDIQ, SATOC, MATOC, MACC, POCA, BOA – exclusively enhanced 400, 000 line item electronic RSMeans Cost Data.